The Archaeological Museum of Piraeus has reopened to the public following extensive refurbishment work and installation of an air-conditioning system, the Culture Ministry said yesterday. The Museum is open from 8.30 a.m. to 3 p.m. daily except Monday. 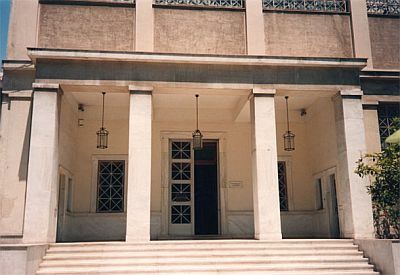 Archaeological Museum of Piraeus, 31 Harilaou Trikoupi Street, Piraeus, tel 210 4521598. Posted by grhomeboy in Arts Events Greece, Baseball Handball Volleyball, Movies Life, Movies Life Greek. The Hellenic American Union presents a screening of the awarded documentary Who’s on first? by the Greek-American director, Valerie Kontakos. The screening will be held on Wednesday, March 26th, 2008 at 20:00 in Hellenic American Union Auditorium, Athens. The documentary, which was shot in the U.S.A., Greece and the Netherlands, recites the story behind the launch of the first Greek baseball team after Olympic Committee’s assignment to Athens of the organization of the 2004 Olympic Games. The documentary was screened in Thessaloniki Documentary Festival (2006) and won Best Documentary Award at the Los Angeles Greek Film Festival (2007). What happens when Greece, a country with no background in baseball, is suddenly required to field a team to compete in the 2004 Athens Olympics? When Athens became host to the 2004 Olympic Games, Greece was thrust into the task of creating a national baseball team that would compete in the Olympics. One problem, Greece had no team, players or stadiums in which to play. What started out as a quirky Olympic novelty turned into a transatlantic Greek tragedy. Who’s on First? is a documentary that chronicles Greece’s bittersweet effort to establish the until-now foreign sport of baseball. With no cultural or historical context in Greece, baseball has nonetheless captured the imaginations of Greek athletes, who are now bent on bringing Greece into the line-up of Olympic baseball teams. Before this happens, however, they have to learn the game. In September of 1997, after many years of Herculean, but unsuccessful efforts, Athens was chosen to be the host city of the 2004 Summer Olympic Games. The Games were finally coming home to Greece, bringing baseball with them. As the host country, Greece automatically qualified to compete in all team sports. 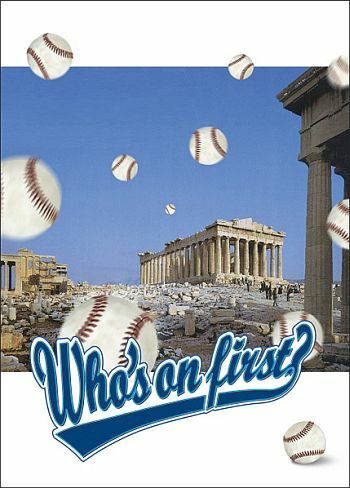 In 1997, when the Hellenic Baseball Federation was founded, baseball was non-existent in Greece. No one knew what or where first base was, let alone what an inning was or how many there were in a game. How would it be possible to train athletes in less than five years to become Olympic-grade baseball players? How could the Greeks compete against the Cubans, Japanese or even Italians? The Baseball Federation realized it desperately needed outside help and turned to Greeks of the diaspora, especially those in America and Canada. Many Greek-Americans in the U.S. responded to the call, in fact the response was overwhelming. It was a dream come true for hundreds of Greek Americans who had played baseball in high school or college. They suddenly found themselves dreaming of Olympic glory. Two of those hopefuls were Chuck Samiotis and Billy Galatis. Americans of Greek descent, living in Boston, Massachusetts, and in their mid-40s. They saw an ad in a Greek American newspaper and decided that this was their calling. They hired a professional baseball trainer and dedicated all their free time to preparing for the Olympics. Another Greek American, businessman Peter Angelos, owner of the historic Baltimore Orioles, also came on board to help the fledgling Greek baseball effort. Angelos put his organization behind this project and bankrolled the effort to the tune of one million dollars. Orioles scout Rob Derksen became the manager and went out scouring the U.S. and Canada for professional players with Greek ancestry. The Greek government agreed to issue a Greek passport to anyone with one Greek grandparent and to waive the mandatory military service for all males. The results were excellent. In 2003, the national Greek team, consisting of 22 Greek Americans and two Greeks, won the silver medal in the Pool A European Baseball Championships. The next step was the Olympics! But not everyone was happy. The Greek baseball players were beginning to worry about their prospects of making the team. Now that the Greek Olympic team was a serious medal contender, was there any place for them on the team? And what about Chuck and Bill, who continued to pursue their dream until the very last game the Greek team played? In the end, the tragic loss of Rob Derksen left a void that was irreparable. A discussion with the director will follow the screening. Admission is free to the public. Hellenic American Union, 22 Massalias Street, Αthens, tel 210 3680900. These Greek mini pizzas are great for kids’ parties. Turn the oven on to the broiler setting and use a small mixing bowl to assemble the topping. Add the chopped roasted red peppers, sliced Kalamata olives, thinly slice red onions, a handful of chopped fresh mint, a drizzle of olive oil, a good squeeze of lemon juice and a pinch of red pepper flakes and mix it up. Next, brush a little olive oil over the top of the pita rounds, on a baking tray, crumble some Greek feta cheese on top of the pitas and pop them under the broiler to bake. The feta cheese isn’t necessarily going to melt but you want to make sure it’s hot all the way through and to give the pitas a chance to crisp up a little bit. To finish, top each pita with a spoonful of the red pepper mix and pop it back under the broiler just long enough to warm through. Bon Apetite!